“These are dark times, there’s no denying,” declares the Minister of Magic, portrayed by Bill Nighy. Truer words were never spoken. The opening line of “Harry Potter and the Deathly Hallows – Part 1″ is not to be taken lightly. After directing the last two Harry Potter movies (“Harry Potter and the Order of the Phoenix” and “Harry Potter and the Half-Blood Prince”), David Yates takes us on a dark, gripping and sometimes chilling journey as the most successful motion picture franchise of all time moves one step closer to ending. Gone are the days of the Hogwarts Express and Quidditch matches as Harry (Danielle Radcliffe), Ron (Rupert Grint), and Hermione (Emma Watson) steal away with the intent to find and destroy the remaining Horcruxes. Lord Voldemort, played to immoral perfection by Ralph Fiennes, is becoming increasingly powerful, posing danger not only to the Wizarding world, but also to that of the Muggle world. In the tradition of staying true to J.K. Rowling’s book series, “Harry Potter and the Deathly Hallows – Part 1,” has “grown up” along with the main characters, making this a movie best left to adults and older children. From the opening scene of the movie, a meeting of Voldemort and several of his loyal Death Eaters, it is clear the viewer is in for an intense two and half hours. A teacher from Hogwarts hangs in mid-air, begging for mercy, while Lucius and Dracoy Malfoy (Jason Isaacs and Tom Felton), Bellatrix Lestrange (Helena Bonham Carter), Severus Snape (Alan Rickman) and others sit in reticent silence as Voldemort unleashes his evil upon her. Meanwhile, the Order of the Phoenix is planning to transport Harry safely to the Weasley home, knowing that the task at hand will be a difficult one, as the Death Eaters are desperate to deliver “the Boy who lived” to Voldemort. After a grueling excursion, involving a bloody and deadly battle, Harry arrives at the Weasley home, in time for the wedding of Bill Weasley (Domhnall Gleeson) and Fleur Delacour (Clémence Poésy). When Death Eaters crash the event, Harry, Ron and Hermione begin their long, treacherous journey in search of the remaining Horcruxes. Along the way, their friendships and loyalties are tested, as they make new discoveries that sometimes lead them deep into enemy territories. For the first time in the Harry Potter movie series, Hogwarts is never visited, and magic seems to take a back seat to the hardships of growing up. Harry is not even eighteen, yet he feels the weight of the world on his shoulders. Adding to his burden is the knowledge that his friends are in constant danger by choosing to accompany him. To keep her parents safe, Hermione has erased their memory of her. Ron has left his family behind, and listens to radio broadcasts for the names of the missing and dead, in hopes that they are safe. In this chapter of the Harry Potter series, these three characters are, more than ever, the main focus of the story. The rest of the cast is abundant in numbers, if not in screen time. Lovable Hagrid (Robbie Coltrane), the perfectly pink and horrible Dolores Umbridge (Imelda Staunton), Ginny Weasley (Bonnie Wright), the comical Weasley twins, Fred and George (James Phelps and Oliver Phelps), and loony Luna Lovegood (Evanna Lynch), among others, are joined by newcomers, including Rhys Ifans as Luna’s father Xenophilius Lovegood. It is Xenophilius who reveals the crucial legend of the Deathly Hallows to Harry, Ron, and Hermione. The telling of the tale is depicted in a gratifying, silhouetted animation. Having a little more screen time than many others, Oscar nominated Helena Bonham Carter (“The Wings of the Dove” 1997) continues her outstanding portrayal of Bellatrix Lestrange. Her presence helped to ease the disappointment of seeing so little of Snape, always so well played by Rickman. To counter the mostly woeful movie, a little comic relief is added by, of course, Fred and George, as well as returning elves, Doby (Toby Jones) and Keacher (Simon McBurney). If the viewer has not read the book, it may make the movie seem a little more choppy and difficult to follow. There is a large amount of important information in the last book of the series, and the movie feels slightly condensed, even at approximately two and a half hours. Splitting the last book of the series into two movies was definitely a wise choice, even though it leaves the viewer wanting more at the end of Part 1. Prior to seeing “Harry Potter and the Deathly Hallows – Part 1,” another viewing of “Harry Potter and the Half Blood Prince” is suggested. The refresher might help in making the current movie easier to follow. 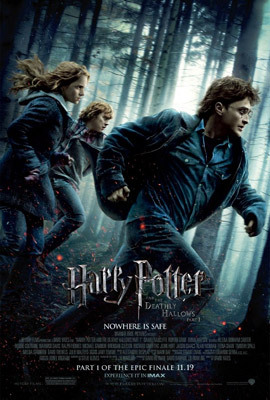 Overall very pleasing, “Harry Potter and the Deathly Hallows – Part 1” is a gut-wrenching, emotional, and sometimes scary movie that fills us with both anticipation and dread, as we await the ending of an ongoing story that has entertained us for a decade. It is unfortunate that younger children will need to wait a bit longer before enjoying it, but to be true to the book series, it is a necessary evil.